Childish Gambino (a.k.a. Donald Glover) has postponed a string of upcoming shows on his "This Is America Tour" due to a foot injury. According to TMZ, he arrived at the iHeartRadio Music Festival in Las Vegas on Friday night (September 21) in a wheelchair and leg brace, which were removed just prior to his performance. In Dallas on Sunday night (September 23), he left the stage early and did not return, having apparently aggravated the pre-existing injury. Several eyewitnesses told TMZ that the rapper broke his foot. Tonight's show at the Forum in Los Angeles has been postponed. Tomorrow's Childish Gambino show at the Forum has been postponed. Tickets will be valid at the newly scheduled date when announced. Thank you. 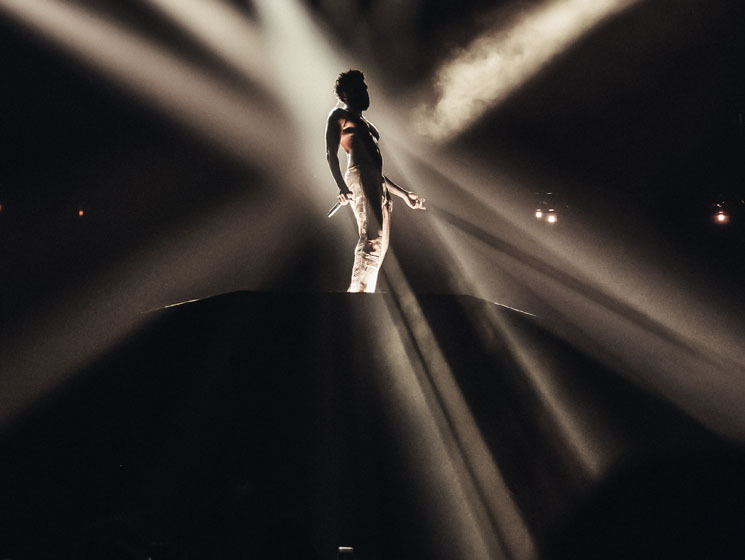 Childish Gambino's tour was slated to wrap up with shows in Oakland (September 27), Seattle (September 29) and Vancouver (September 30), though none of the local venues or promoters have made announcements as to the status of those shows yet. UPDATE (9/27, 8:50 a.m. EDT): Gambino has mapped out a list of rescheduled dates. Find them here. Fam Rothstein, Glover's Atlanta collaborator and member of the Royalty collective, tweeted to confirm that the tour was postponed, not cancelled, and assured fans that the dates would be made up before the end of 2018.